Reprinted with permission from Wegman's Food Markets, Inc.
We tried this soup a couple of weeks ago and were so impressed that we asked the good folks at Wegman's if we could present it for you! This squash and pear soup recipe is as good as it gets! We loved it so much we contacted our friends at Wegman's Markets and asked for permission to share it. The combination of squash and pears along with onion and thyme makes this delicious soup a savory and sweet delight to the senses! Squash and pear soup is an excellent dish to serve any time but we think it really makes for a wonderful holiday addition to our menu...we hope you do too! 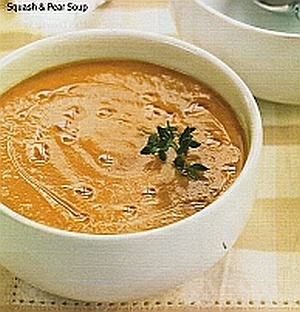 Enjoy a bowl of this tasty squash soup, accented with sweet D'Anjou pears. Yum! Heat oil over medium heat in a large stockpot.